Happy Memorial Day weekend everyone! We at Bridal Spectacular have another real Las Vegas wedding to share that is simply breathtaking! 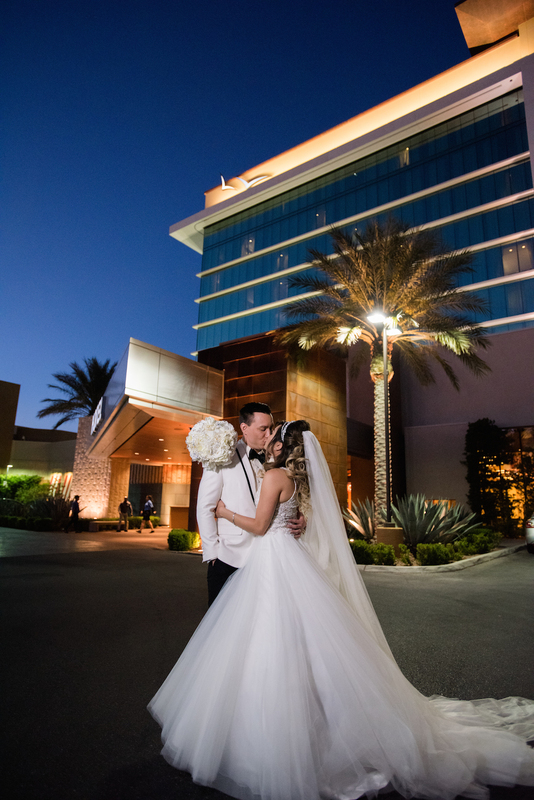 As featured in Spectacular Bride Magazine, Erica and Eric’s gorgeous Las Vegas wedding began with a stunning alfresco ceremony overlooking the sparkling pool at Aliante Hotel & Casino. They featured all-white ceremony décor, including the floral arrangements, chair sashes, altar, and aisle runner. To top it off, they boasted one of the largest wedding parties we’ve ever seen! The bridesmaids were dressed in elegant lavender floor-length dresses holding a white umbrella and the guys sported sleek gray tuxedos. After the ceremony, they celebrated their nuptials with a chic indoor reception. Here, they maintained the white and lavender color scheme finished with silver details. From the table linens, chair sashes and ceiling canopy, to the stunning five-tiered wedding cake, donut bar and wedding signs — each and every detail was executed flawlessly! We hope you enjoy this glimpse of Erica and Eric’s stunning wedding as captured by Mindy Bean Photography. Mindy and Doug Bean are a husband and wife photography team that specializes in full-day weddings, engagement photos, bridal pictures, family portraits, maternity, child and baby photos, pet photography and much more.